• Before we get into what happened on – and off – the field yesterday, let me ask you: Are the Seahawks the Northwest’s most “successful” professional sports franchise? It probably depends on your definition of “successful,” thus the quote marks. The Mariners hold a major league record for wins in a regular season. Both Portland franchises – the Trail Blazers and the Timbers – have each won as many championships (one). So did the Sonics back in the day. The Sonics and Blazers have also appeared in the NBA championship series – the equivalent of the Super Bowl – three times, matching the number of Seahawk appearances in the NFL title game. But the SuperSonics are long gone and the Blazers haven’t been in the finals this century, so we’ll give the Seahawks the edge. Anyhow, that’s a sidelight. The key thing is the NFL is back, albeit only for practice and only for the week. And the regular season is just around the corner – even if it isn’t officially summer yet. • There are people in every community who work behind the scenes getting things done. Lots of good things wouldn’t happen if they weren’t around, supplying the energy that makes the machine of volunteerism run. The same is true of the sporting community here in Spokane. All of the major events we love so – and minor ones that give us a well-rounded life – wouldn’t happen without these folks. Sadly, we lost one of them yesterday. Ed Sharman, whose voice has been recognizable in Spokane for more than 50 years, even as his face faded into the background, died Tuesday at age 78. Our John Blanchette has Sharman’s obituary in today’s paper and it includes information about a person who got things done in Spokane. You may or may not have personally known Ed, but if you did, you know our sports community is diminished a bit today. • WSU: The Boise State game, the Cougars one non-conference road game, will start at 7:30 PDT Sept. 10. We have a blog post and a story to pass along. 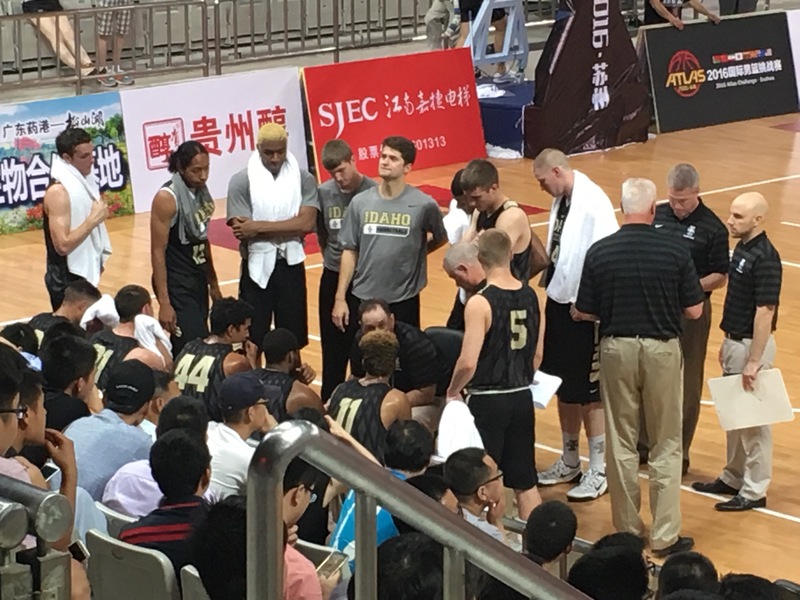 • Idaho: The Vandals are in China playing in the Atlas Challenge – I wonder if the wait of the world is one their shoulders? – basketball tournament. They had their first game yesterday and won, defeating the Lithuanian national team 71-69. Sean Kramer has a blog post with more information. • Chiefs: Coach Don Nachbaur was named the recipient of the first Pat Quinn coaching award from the British Columbia hockey hall of fame. • Indians: Spokane opened practice yesterday for the Short A season that begins Friday. Talk about a compressed timeframe. Josh Horton has the story, focusing on manager Tim Hulett’s recent overseas adventure. • Mariners: As the season slowly sinks into a quagmire of lost chances, last night’s game might just be forgotten. But it shouldn’t be. It was a game the M’s should have won, leading 4-0, 5-2 and 7-4 before losing 8-7. Taijuan Walker left early with a sore leg, the bullpen imploded late and the M’s fell 5 1/2 games behind Texas. ... The new/old lineup scored plenty of runs though. ... Nathan Karns takes the hill against his old team tonight. • Seahawks: There was off-the-field news as well, with punter Jon Ryan quitting social media while he was still ahead, though let’s hope he returns sometime. He’s too much fun to follow. ... There were a number of players who didn’t participate yesterday due to injuries, but the most notable was Michael Bennett. He was in camp, though not participating due to an ankle injury. His contract situation was on everyone’s mind, but Bennett mainly laughed it off. • Sounders: Argentina had little trouble with Bolivia last night in the final Copa America group play match, winning 3-0. Lionel Messi did play in front of the CenturyLink fans, but he didn’t score. That doesn’t mean he didn’t delight the 45,753 in attendance. ... Besides the Copa America action, the U.S. Open Cup is ongoing, with the Sounders playing tonight. There were lots of games last night, including wins by the Portland Timbers, Real Salt Lake and the L.A. Galaxy, though the last two were quite tough.